fruit Archives - MOMables® - Good Food. Plan on it! fruit Archives - MOMables® - Good Food. Plan on it! Simple, healthy, and delicious, these Apple Cinnamon Overnight Oats are your new favorite breakfast! They’re gluten-free & great for busy mornings. Oh, overnight oats! The simplest breakfast there ever was. I mean, what’s better than waking up to breakfast already completely done? I can’t think of anything else! I love to mix up my overnight oats using seasonal flavors. Banana Fosters oats all year round, fruity oats with berries in the summer, pumpkin in the fall, and also apples in the colder months! Apples are so crisp and sweet right now, and they’re so amazing in these creamy overnight oats. Cinnamon adds a wonderful spice to the oats that isn’t overpowering – so your kids can definitely handle it! These couldn’t be easier – 5 minutes of prep at night to have breakfast waiting for you when you wake up. 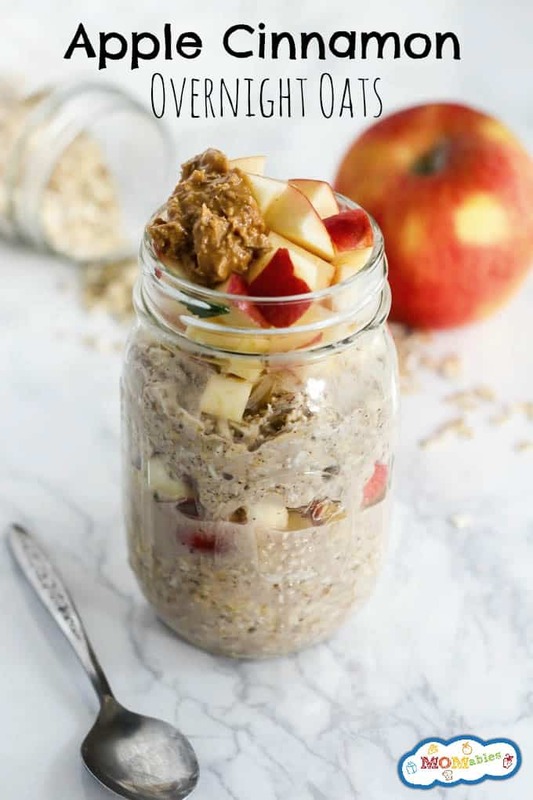 Make a few jars of these apple cinnamon overnight oats to eat throughout the week and you won’t have to think about breakfast ever again! In a mason jar or bowl, add oats, milk, honey, and cinnamon. Stir to combine. Top with desired toppings, such as peanut butter, pumpkin seeds, or raisins. Your kids will love getting hands-on at snack time making these Chocolate Covered Apple Slices! There’s 6 ways to make them with fun & tasty toppings. Snack time just got way more fun! I love to get my kids involved in the kitchen as much as I can. From letting them stir ingredients to having them chop vegetables, I try to make the kitchen a hands-on environment. 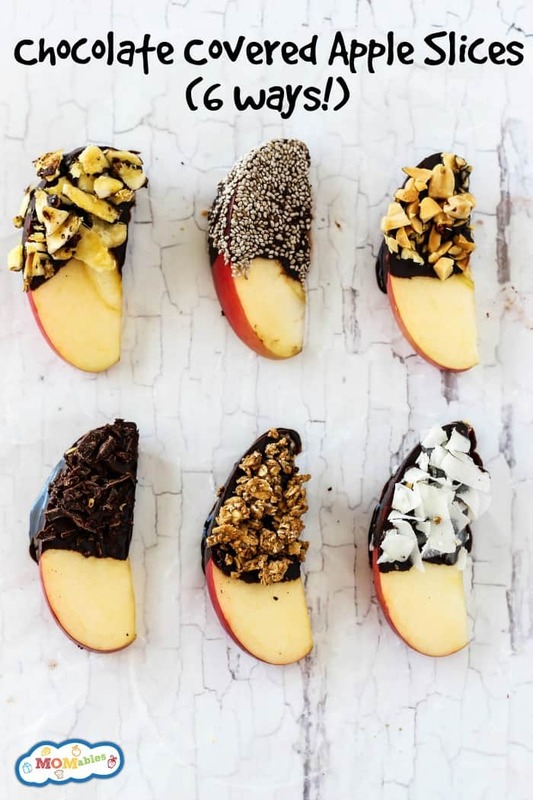 These Chocolate Covered Apple Slices are the perfect way to get the kids involved in preparing food! They will have so much fun preparing all the toppings and dipping the apples in chocolate. 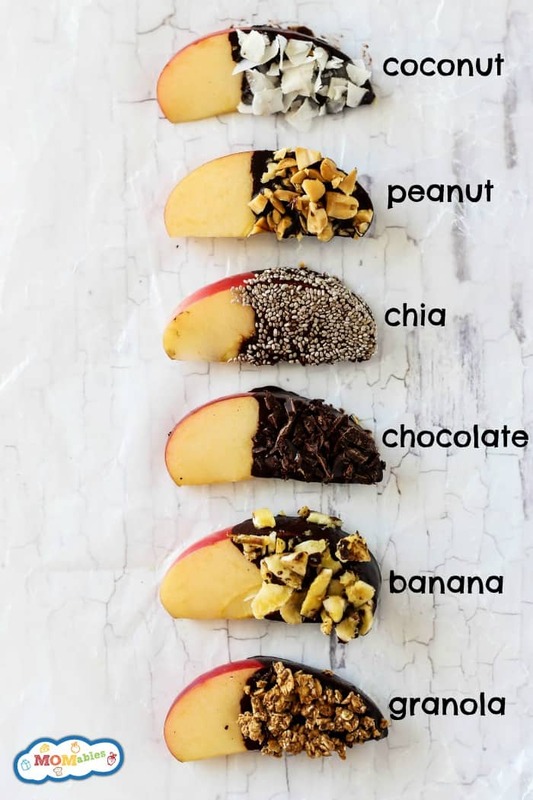 Let us know what toppings your kids would love on these chocolate covered apple slices! Enjoy! Slice the apple into wedges, removing the core and seeds. In a small bowl, add chocolate chips. Microwave in 30-second intervals until completely melted, stirring in between. On a cutting board or a sheet of wax/parchment paper, place all the toppings separately. Dip each apple slice into the chocolate, then roll into a topping. Place onto a sheet of wax/parchment paper until the chocolate hardens. Repeat until you use all the apple slices and toppings.